Some time ago I made an embroidered cushion for my neighbour featuring a Black Spaniel embroidery to reflect her two spaniels, Mollie and Meggie. 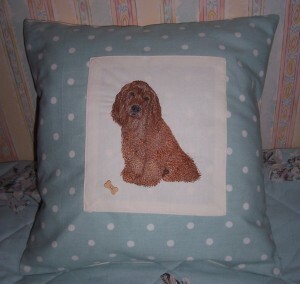 One of Mollie’s puppies was purchased by local villager who has often admired the cushion. Eddie is a Chocolate Spaniel and I was asked if I could make another cushion, but this time featuring a “Brown” Spaniel on a Duck Egg Blue cover. Even in my massive stash of fabrics I could not locate any suitable fabric and having trawled the internet finally purchased a ready-made cover featuring a Duck Egg Blue spot heavyweight cotton fabric. I misread the description of the cover so was disappointed to discover that only the front was the featured fabric and the reverse was plain cream calico but was advised would still be acceptable. I set up the embroidery unit on my Brother 4000D machine with a 100% cotton plain Cream-coloured fabric and identified the different threads to be used for the design which was purchased from www.emblibrary.com. There are 7 different shades of thread in the design which for the 7” x 5” design is made up of 21,425 individual stitches and took approximately 45 minutes to stitch. I took the original Duck Egg cover apart and stitched the now embroidered panel to the centre front. Then I put the cover back together whilst taking the opportunity to add my own printed satin ribbon label.